Strips: Sgt. Fury and His Howling Commandos, Captain Savage and His Leatherneck Raiders, various one-shot stories from Marvel USA's 1950s titles. Comments: Launched in March 1977 (cover dated 16th, but likely in the shops on the 10th), Fury was Marvel UK's attempt to attract the readers of British war comic titles such as Warlord and Battle, reprinting US WWII strips such as Sgt. Fury and his Howling Commandos and Captain Savage and the Leatherneck Raiders, with new covers by rising star artists Dave Gibbons and Carlos Ezquerra. 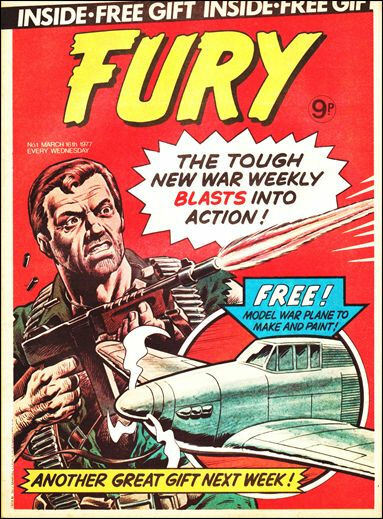 However, the 1960s American war strips failed to win over an audience used to the grittier fare of 1970s British war comics, and Fury was cancelled with #25, cover dated 31st August 1977, merging with Mighty World of Marvel a week later.